How unfortunate. EMI Music had uploaded the official video then removed it. I had to go with this version, music, but no video. 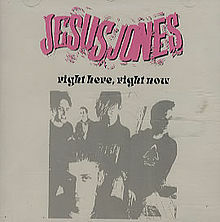 "Right Here, Right Now" is a song written by Mike Edwards and recorded by the British band Jesus Jones from the album, Doubt. A single was released in September 1990, peaking at number 31 on the UK Singles Chart. In the United States, it was a number one song on the Billboard Modern Rock Tracks chart and reached number 2 on the Billboard Hot 100 in July 1991. The song was inspired by events in Eastern Europe of the late 1980s and early 1990s, such as the fall of the Berlin Wall. "Right Here, Right Now" was used by Joe Clark in his successful campaign for the leadership of the Progressive Conservative Party of Canada in 1998, and by candidate Gerard Kennedy at the 2006 Liberal Party leadership convention in Canada. "Right Here Right Now" being used as the backing track for the 2011 Rugby World Cup ticket TV commercial in New Zealand. The cover version by kiwi band "The Feelers" is being used. Doubt is the second album by the British rock band Jesus Jones in 1991 through Food Records, distributed by SBK Records and via Parlophone. The album reached #25 in the US and topped the UK chart. Jesus Jones are a British alternative dance band. The Wiltshire-based group, formed in late 1988, recorded and performed in the late 1980s, throughout the 1990s, and into the 2000s. They are best remembered for their track, "Right Here, Right Now", an international hit and subsequently globally appropriated for promotional and advertising campaigns. I think the video above has better sound quality, but here's the official one.